It's finally Sale-A-Bration time and I'm excited to say that I am joining in my first ever blog hop to celebrate. If you are not sure what Sale-A-Bration is all about I will explain it all in my next post and if you are not sure what a blog hop is....well....... Myself and a group of super talented demonstrators from Australia and New Zealand have gotten together to showcase projects made with the new Sale-A-Bration goodies. The blog hop is designed so that you can 'hop' from one page to another. You may have come to me from Kelly Nelson's page and are already happily hopping along or have come straight to me and get to start your hop here. Now when you are done looking at my creation just click on the link at the bottom of the page and you will be taken to see Yvonne Walker's fabulous creation. So without further ado here is my card for you. 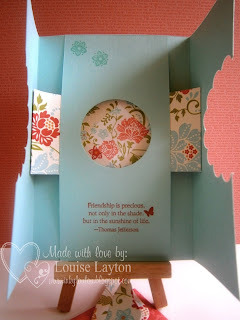 It is made using the 'Everyday Enchantment' designer series paper (LOVE!!!) and 'Fresh Vintage' stamp set and some of the current In-Colours (Pool Party; Lucky Limeade; Calypso Coral; Poppy Parade & Peach Parfait). This card is known as a Marquee card or as I like to call it a "Ta-da" card. 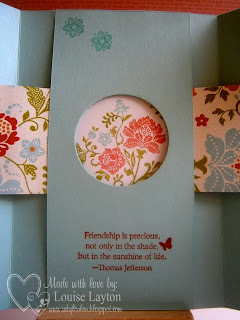 I first saw a "Ta-da" card when it was demo'ed by the fabulous Bonnie Thurber from Stampin' Up! USA at Convention last year and was well and truly "Wow-ed"!!! I have made one other before for one of our 'A Klass Act' team days and just love them so much. The following photos will show you just why I call it a "Ta-da" card. This is a photo of the 'belly band' that holds the card together. I added a scallop circle and the butterfly on top made with the double cut shown to us by the gorgeous and super talented Kirsty Brown (if you are reading this Kirsty- hi!!!!). I used the gorgeous Sale-a-bration DSP for both of these. You see the beautiful stamped image from the 'Fresh Vintage' Sale-A-Bration set in the window. How snazzy is that?!?!?!?! (The sentiment below the window is from the 'Precious Butterflies' hostess set by the way). awesome!! now i need a tutorial for that card!! Great card Louise. I am totally mesmorised by the beautiful b'fly. To take that off and find the card....WOW. Just beautiful. Gorgeous Louise. I love butterflies and your card has even more goodies underneath. 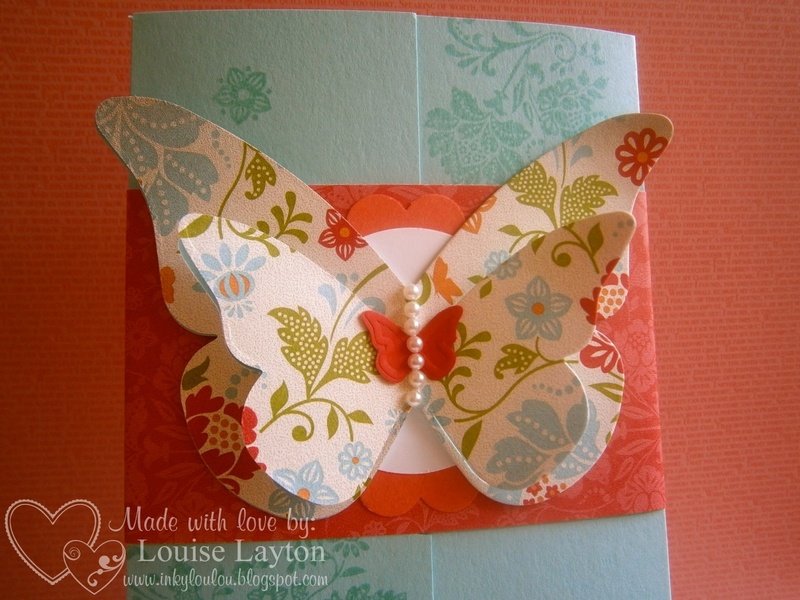 Love your card Louise, butterflies must be the thing for the day, many have been used. what a Beautiful Card that is!! love the colours with that set - so pretty! ooh tricky! Love this card! Fabulous card Louise - thanks for sharing! Beautiful Louise! Such a surprise inside. I love these but forgot about them. Thanks for the reminder! This is a real WOW card! Great job and would love a tutorial please! What a fun card, love the butterflies! I see why you call it a "ta da" card, just beautiful. I haven't tried this card yet so I think it is about time I did. Thanks for sharing. Wow what an interesting card, no wonder it is called the "Ta Da" card. Very nice. So pretty!! Love the ta-da card!! Thanks for sharing! I am yet to perfect this "Ta Da" card. I have tried a couple of times and I have had to strip down the card for reuse in some other project. Or it has landed in the pile in the corner. I dont want to give up on this card though. I wont let it beat me but I dont seem to be able to perfect it yet. Beautiful projects Lou, so pretty! 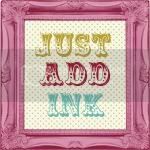 Love the look of your blog too! Wow, that's a really awesome version of Bonnie's ta-da card. I haven't been game enough to try it yet, but you sure blitzed it! Well done! What a really beautiful card - it really is "ta-da". Love how you've combined the two butterly dies on the front. Thanks for the inspiration. This paper just looks gorgeous in butterflies doesn't it? Lovely projects. I need to try a Ta-Dah card, yours is just stunning! Love the belly band you made for it too. Ta-dah indeed!This is such a beautiful card & the ta-dah inside makes it even more special. Love the butterfly detail in front too. Just gorgeous!